Mission calls for bag donations for winter The Wellington City Mission is encouraging the public to get involved with the Brown Paper Bag Collection as winter starts to bite. The Mission says that during winter too many Wellingtonians are forced to choose between paying for heating or rent, or between getting groceries or warm clothes. Donors can get involved by either filling a shopping bag with goods and dropping them off at any Z Energy Station, where the special Brown Paper Bags are also available, or by getting in touch with the Mission to request some. They can also donate online at the Mission’s website. Specially marked envelopes are also available at Z stations for making financial donations. “Generous support of the Brown Paper Bag Collection will help the Mission provide food parcels for families on low incomes, so they don’t have to choose between food and heating this winter,” communication co-ordinator Kelly Henderson says. “You’ll provide financial mentoring to help people avoid falling into crippling debt because they can’t pay a large power bill. “You’ll ensure the Mission’s Drop-in Centre can offer hot meals, daytime shelter and a place of community for people facing social isolation or homelessness. “The impact of this support often goes much further than we realise. Along with helping people get through the challenging winter months, it sets them up for a better future too.” Last year the Mission provided over 3500 food parcels from its Foodbank and over 23,000 meal servings in its Drop-in Centre. The Brown Paper Bag Collection runs until July 31. What do you look for in your smile? inbrief news Regional confidence up: Survey A net 39 percent of households in the Wellington region expect their local economy to strengthen over the coming year, according to a survey by Westpac-McDermott Miller for the June quarter. This is slightly better than the net 35 percent recorded for the March quarter and confirms that households in the capital are among the most optimistic in the country. Westpac Chief Economist Dominick Stephens cites strong inward migration, rising house prices, better job prospects in the public sector and the possibility of higher wage growth following the change of government as likely factors. Patients are set to benefit with the launch of a new direct-to-patient prescription delivery service that aims to address the high levels of medicine non-adherence in Wellington. A Zoom Health study into the level of adherence to prescription medication has found 30 percent of Wellingtonians have had a doctor’s prescription which they have not filled. Four in ten respondents said they felt their condition had changed and they decided not to pick up their prescription, cost was the major barrier for 18 percent, while 16 percent felt apprehensive about potential side effects. inbrief news Prepare for more strokes Although the incidence of stroke and mortality are declining due to better management strategies, stroke volumes are going up in New Zealand due to a growing and ageing population. New research from the Department of Medicine at University of Otago, Wellington, has found that stroke volumes will grow by around 40 per cent over the next 10 years. The research describes realistic projections of the number of people likely to require stroke treatment in New Zealand. “We knew it would go up but didn’t expect the increase to be quite this high,” says Associate Professor Anna Ranta. Action called for Smokefree 2025 A group of tobacco control experts published an open letter last week in the New Zealand Medical Journal calling for bold new actions from the Government to achieve the Smokefree 2025 goal. The group, which included experts from the Cancer Society and the University of Otago, Wellington, is calling for the vision of the 2010 Māori Affairs Select Committee Inquiry on the tobacco industry to be revived. That vision included a reduction of tobacco retail outlets, and a reduction in tobacco additives, as part of the work to reduce health inequalities between Māori and non-Māori. State of volunteering concerns Low recruitment rates, funding issues and decreasing time given to volunteering are the greatest issues facing volunteering, according to Volunteering New Zealand. Their 2017 State of Volunteering 2017 report was released in Parliament last Thursday, had 1584 responses to topics covering volunteer engagement, issues within the sector, recruitment. Results suggest New Zealand has an ageing volunteer force, with older volunteers sometimes not fit enough for the physical activities demanded. However, 350 organisations stated that they were not experiencing any significant issues. owners allowed the tenants to put in.” It was all started by Robert Logan who went missing on the South Coast in 2010 and was never found. A side track in the reserve is named in his memory. “While he was here with us we were collecting rubbish and weeds. Since then there’s been a lot of natural regeneration.” As well as the abundance of kawakawa the reserve is named after, there is a notable amount of lemonwood, flax and kowhai, some of which the pupils planted on Tuesday. “We only plant those which are native here,” co-chair Max Beauchamp says. There cause is all the more important due to damage done by the 2013 storms - 16 trees came down in the area. Two Norfolk pines remain, one of which still has branches missing. It is not the first mass treeplanting conducted by a school in the reserve. Last June pupils from Berhampore and St Francis de Sales schools planted 1500 trees for Arbor Day. whether they are affected. “The Emergency Department [ED] at Wellington Regional Hospital will remain open during the strike, and people can rest assured that anyone who requires urgent and life-saving care will receive it,” Chris says. People are, however, asked to remember that ED is for emergencies only. People with non-urgent injuries or illnesses should see their GP or after-hours service in the first instance. Wellington Regional Hospital’s delivery suite and maternity ward will remain open. A number of midwives who are not NZNO members will work during the strike action. Geneva Healthcare General Manager Lindie van Wyk says the company will work closely with the DHBs to continue providing healthcare services to outpatients. “We also support and assist the nursing community through placements with our Temporary and Permanent Healthcare Recruitment Services to ensure the availability of staff at the DHBs especially during critical periods,” Lindie says. Ferns sculpture to be re-installed The iconic Ferns sculpture was re-installed in Civic Square on Wednesday, almost exactly three years after the original was deemed to be unsafe and taken down. Wellington Sculpture Trust chair, Sue Elliott said: “It has been a long journey since the original Fernscame down – a tale of earthquakes, engineers, building consent exemptions, fundraising and other commitments for virtually all the parties. The new Ferns is as close as possible to the original, but has a stronger internal structure and is cut from stainless steel, which is more robust than the original aluminium. Cemetery Bus Service Karori & Makara Cemeteries This bus service is sponsored by Lychgate Funerals. It operates on the first Tuesday of each month. (If the first Tuesday is a Public Holiday then the bus trip will take place on the following Tuesday). The cost of the return trip is $5.00 per person. Robert Laking is now a curatorial intern with the National Portrait Gallery. ternship through interactions with visitors, staff and artists. “I think it’s important that people are able to experience culture, which is not so common anymore.” Robert will work part-time as a curator for seven months alongside his work as a studio artist based at Wellington’s MEANWHILE gallery on Willis Street. $126,000 of funding over the next three years for the Newtown Festival. There were a number of detailed questions to officers from Councillors challenging the level of funding being out of step with other festivals and questioning whether the Council should be involved in funding a festival for one specific community at this level. But during debate, those strongly supporting it – which included fellow southern ward councillor David Lee and mayor Justin Lester - made the strong point that it was a music, dance and food festival that people from all over Wellington attended and valued. Fleur says this level of funding is consistent with what it has received in the past. Association for years. At the suggestion of the Council last year, the operation of the Festival moved from the Residents’ Association to a specially dedicated Trust. Fleur says the Festival has been actively nourished and supported by successive Wellington City Councils and has developed a national reputation as an important platform for emerging artists. due to the small class sizes each student receives a high level of teacher contact,” says Steve. “Our vision at St Catherine’s is to create an aura of success and ambition for our young women.” He said the Catholic girls’ college nestled in the hills behind Kilbirnie had a small number (10 percent) of ‘non-pref’ (non-Catholic) places, but that these were highly sought after. The college also last month again jointly won the O’Shea Shield, an annual competition held between 17 Catholic schools drawn from Hawkes Bay, Taranaki and the wider Wellington area. He says the school is currently taking enrolments for year 9 students in 2019, and encouraged prospective students and families to come to see for themselves. He points out that the 10 percent of places available to non-Catholic students went quickly and that anyone interested should make contact with the school as soon as possible and come along and have a look. partnerships,” the Mayor says. “This is the outcome of 18 months of hard work by officers, councillors and community groups.” The Mayor says the Council intends to work closely with the Government. The Hon Phil Twyford, Minister for Housing, says the proposed housing solutions showed show forward-thinking by the Council. “The Housing Strategy is about ensuring future generations of Wellingtonians have good, decent homes.” It is estimated that up to 30,000 new homes will be needed by the year 2043.
readers have their say... Find out the WORD on the Street. Question: Does strike action (or threat of it) by nurses, teachers and public servants concern you? Andrew Sweet, Island Bay Probably concerned about the effect. There’s a lot of awareness about pay parity. People are talking about what they are paid more nowadays. Brenna McGuinness, Island Bay I think good on them. It takes a lot to take a stand and it’s easier with others. They’re putting on a united front; standing in solidarity. Mark Gannaway, Seaview It’s not good. Nurses striking leaves people vulnerable. National got things done whereas Ardern’s [government] is concerned about where the extra money is coming from. Jeanette Troon, Island Bay I’m concerned that they are underpaid for the valuable service they provide. Why not have a class-action strike? It has more impact. Holly Kennedy, Newtown It does, but I support nurses, and teachers to a degree. People wouldn’t go on strike if they weren’t unhappy. Things have been left to slide for too long. Brendan Hohepa, Porirua It concerns everyone. My wife is involved with nursing. When National was in government there was privatisation and it never worked. The strikes redress the imbalance. LETTERS to the editor WHAT IS THIS MAN TRYING TO SAY TO US? WHAT IS HIS ULTIMATE MESSAGE? Pope Night 7pm Wednesday 4 July ST ANTHONY’S GASCOIGNE ROOM 66 Falkirk Ave, Seatoun All Welcome! Hair gets wacky for a good cause CAN FLOWERS HELP IN DIABETES? THE FLOWER STUDY We are looking for people with pre-diabetes to trial a new flower extract to see whether it can reduce blood glucose levels. It will require 4 visits to Wellington Hospital for 3 hours each time. www.Jimsmowing.co.nz V NE OLU ED NT ED EE NO RS W CAN FLOWERS HELP IN DIABETES? THE STUDY THE FLOWER CAN FLOWERS HELP IN DIABETES? We are looking for people with pre-diabetes to trial a new flower extract to see whether it can reduce • Carpet repairs blood glucose levels. • Broken Seams It will require 4 visits to Wellington Hospital for 3 • Re-Stretching hours each time. We areWe looking for people pre-diabetes to trial a • Carpet Cleaning are looking forwith people with prenew flower extract to see whether it can reduce • Domestic diabetes to trial a new flower extract blood glucose levels. • Commercial toaresee whether itIf with can reduce blood We looking for people pre-diabetes to trial aphone Diabetes Research you are interested please It will new require 4 visits tosee Wellington Hospital for 3 • Free Quotes flower extract to on whether it can reduce 8062458 or email diabetesresearch@ccdhb.org.nz glucose hours eachlevels. time. blood glucose levels. Itwill willrequire require 4 to visits to Wellington It 4 visits Wellington Hospital for 3 hours time.each Hospital for 3each hours time. in local and international competitions. We encourage new members, both beginners and improvers, and are equally happy to help those who have been away from fencing back into this exciting and rewarding martial art. Fencing is an amazing sport that caters for almost any age and fitness level. It will teach self-discipline, situational awareness and hone your reflexes like you wouldn't believe! Best of all - it's great fun! Contact us at www.southwellingtonfencingclub.com to find out more about our first lesson free offer. skating, Laserforce, Movies, and Bowling based at various locations around the region. www.ymcawellington.org.nz Winz subsidies available for all offered programmes. Jessica Bo Peep Throw on your woolly jumpers these school holidays and join KidzStuff for an adventure of discovery. Jessica has not only lost her sheep, but whilst out trying to find them, she has now lost herself too. How can she protect her sheep? Will anybody help her? Do you remember the way home? And who is that strange kid with the tail? Bo Peep is full of fun characters, silly songs, valuable life lessons and did we mention a talking dog? So, polish your hooves and clippity clop all the way to the Tararua Tramping Club to help Jessica Bo Peep - find her sheep. Visit www.kidstufftheatre.co.nz for more information. book into the show that suits you best! Bookings: www.eventspronto.co.nz/ KidzStuff or 027 567 5664.
also offer fun-filled Kelly Club and Sports OSCAR approved programmes throughout Wellington in Island Bay, Wilton, Johnsonville, Churton Park and Porirua. Visit www.kellyclub.co.nz, www. kellysports.co.nz, email adminwgtn@ kellysports.co.nz, or call 04 972 7201 for more information. Join us for a fun filled School Holiday Sports Programme - learn new skills with some of your favourite sports; Rugby, Netball, Football, Hockey and much more!! Enjoy Junglerama, Jumparama, Ten Pin Bowling, Plus a trip day! Programme ‘Let There Light’ runs from 18 and 19 July, where the kids will learn about how light enables us to see the world around us and they’ll get a chance to create stunning light art with long-exposure photography. There’s also the Winter Science Shows which are quick, fun learning sessions for the kids, also looking at the theme of ‘Light’. POOLS OF SATISFACTION Our summer pools were built by us. Blends in well did cause no fuss. With hydro slide will cause a splash. And to it many people dash. Through native bush we twist and wiggle. From the children brings a giggle. Severn days a week the place is open. Hot summer days we all are hopen! SECURE STORAGE 14sqm $42 per week. including rewiring ground level. Wainui Self Storage,atWaiu St, 0274805150. The LED roll-out has been happening in many cities across country due to Trades andthe Services a significant subsidy by NZTA. The street are expected to have FOR ALL lights ELECTRICAL repairs and ainstallations lifetime four to fi ve times longer by top-qualified electricianthan with the old sodium-powered Gough lights. record also of overuse fiftyhalf yearsasof much giving locals the They power, lowest cost “around-the-clock” service, just making them much more cost and energy effi cient. phone 977-8787 or 021-0717-674 or email The old lights were powered at up to 250 jack.powell@outlook.com watts on the main roads and 70 watts on side streets compared 158 watts and Situationwith Vacant 27 watts the new ones emit respectively. 2m seasoned pine $180 They are also “smart”, capable of 4m Split pine storethey’re for diagnosing when faulty, and can $330 winter remotely be next adjusted by the Council. Largelights Bags Kindling $13 The are installed at 50 percent brightness to avoid issues with glare. To Large Bags Dry Pine/ adjust the mix brightness residents can call $14 hardwood the Contact Centre, log a Fix It request, in Wainui or Free emailDelivery info@wcc.govt.nz. The estimated cost of the full project is $17 million. The Council will contribute $2.5 million from existing budgets and Trades the remainder will and comeServices from the New Zealand Transport Agency. It is scheduled for completion by December. of Wellington is holding a free concert at St Mary of The Angels on Sunday 1 July 2pm. Bring family and friends. GENERAL ENGINEERING PRODUCTION WORKER A.E. Tilley Ltd is a manufacturing and engineering company located in Rongotai specialising in the manufacture of sheetmetal products. We have a vacancy for a general sheetmetal production/process worker. Duties include operating general engineering machinery, sheetmetal process and assembly work. Experience in an engineering workshop is required. Part time Room Attendants Required The Brentwood Hotel in Kilbirnie seeks part time room attendants to join our team. • Hours are rostered & include weekends. • Applicants should be fit & enthusiastic. • Able to work in fast paced team environment. • Customer focused with fluent English. We provide a uniform, free parking & staff meals. For an interview contact Deb 920-0400. A competitive remuneration package will be offered. tial & Commercial buildings and maintenance work. Quality assured. Phone: Shane - 021987752. 027 447 4706 Renovations/Alterations: Houses, bathrooms, kitchens & decks. Experienced licenced builder. Trade Qualified. BUILDING Consent Approval and house plans. Free estimates provided. Call Doug on 934-1398. 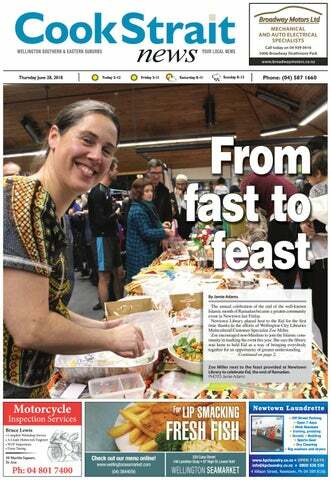 Wellington Suburban Newspapers is a well established privately owned company, that is respected in the market place. Join our warm and friendly team selling advertising to Wellington businesses. Applicants for this position should have NZ residency or a valid NZ work permit of at least 12 months. This role would suit someone who is positive, friendly and not afraid to meet people. Registered Licensed Builder with over 25 years experience . Residential Building, Renovations & Extensions. 0272 377 020 Firewood READY TO BURN PINE 3.6m³ $445, Mac $545. Prompt delivery. Go to www.ezyburn. co.nz or 027 459 4130. If we could capture just 0.1% of the ocean’s kinetic energy caused by tides, we could satisfy the current global energy demand 5 times over. Capital NHL and Black Sticks women’s hockey team, was named Sportswoman of the Year. Kelsey was selected in every Black Sticks event over the past 12 months, including the Commonwealth Games where the team won gold. New Zealand Para cycling champion Kate Horan was named the Cigna ‘Disabled Sportsperson of the Year’ after winning a silver medal at the 2018 UCI Para Cycling Track World Championships. Mountain running champion Melissa Moon, former Black Stick Suzie Muirhead and squash champion Stuart Davenport were inducted into the Sports Legends of Wellington, along with Softball great Kevin Herlihy posthumously. Award for local coaches a first for Futsal Earlier this month, Capital Football Futsal, in conjunction with NZF Futsal, delivered the first Futsal Level 2 Coaching Award. Callum Homes and Todd Bryant from Capital Football and Josh Margetts from NZF Futsal captivated the 16-strong class for two theory and practical-based sessions on their way to the accreditation. “It was an exciting step to be the first federation to deliver the NZF Futsal Level 2 coaching award,” Todd commented at the end of the inaugural course. “Capital are in a fortunate position to have the support of a strong network of coaches who want to develop. “We were excited to be able to offer them the Futsal Level 2 Coaching [Award]”. The exponential growth of Futsal in the capital has been the driving force behind the development of support structures and opportunities for both players and coaches in the community space. “The next step for these coaches is the Futsal NZF/OFC C licence which is likely to be offered at the end of the year. My goal is to get these coaches from the region ready for this next step on their coaching pathway”. Poneke romp home in second-half blitz Poneke held Tawa scoreless for an hour to score a thumping 44-10 win in the Jubilee Cup, their first of the competition. After about 50 minutes, Poneke led 17-10 when fullback Michael Sage retrieved a shallow defensive clearance and sailed through the visitors’ defence to touch down under the posts. Already scrambling to stay in contention, Sage’s solo effort was the nail in the Tawa coffin. Poneke first-five Pakai Turia chipped over two penalties to make it 30-10, before two more tries, the last well taken by rookie wing Johannus Taankink, ensured a blowout. Turia finished with 17 points, slotting seven goals from eight attempts. Poneke started with aggression and polish and when captain Greg Foe steamed into a hole it was 17-3 after 20 minutes. Tawa fullback PJ Iosefo inexplicably dashed 30 metres untouched from a scrum a short while later to make it 17-10, but Tawa was never in the hunt. Tawa remain winless after two rounds, along with Marist St Pat’s who fell 26-35 to Old Boys University at Nairnville Park. Perspective on Phil’s golf faux pas Phil Mickelson’s US Open meltdown revealed more than just one man’s frustrations. The 48-year-old, multiple-time major winner hit his moving ball on the 13th green during round three at the difficult Shinnecock Hills course. Mickelson was well out of contention by the time he did it and he wasn’t the only one to fall victim to a windy course with lightning fast greens and needlessly difficult pin placements. The reaction to Mickelson’s error showed how out of touch golf is. Pundits called for him to apologise to the game of golf for his actions. This seemed to be a massive overreaction. Tournament officials need to admit they made the tournament dull. Ordinary people don’t want to see the professionals forced to grind out four rounds of a tournament. Brooks Koepka won back-to-back titles with a one over par total. They should be the ones apologising. Phil is also a victim of his own stature in the game. His popularity with the public is not matched amongst his fellow golfers. There is no way there would have been the level of outrage if golf’s golden boy, Tiger Woods did it that would stop the cash cow from milking. Mickelson didn’t harm the sport like Mike Tyson’s ear- biting incident did to boxing or Lance Armstrong’s drug cheating in cycling. Golf purists merely live in their own bubble. That’s why youngsters aren’t taking up the game. The old guard won’t get out of their own way. Phil’s actions were silly, done out of frustration but they weren’t game destroying. Not even close.